In line with the directives of His Highness Sheikh Hamdan bin Mohammed bin Rashid Al Maktoum, Crown Prince of Dubai and Chairman of the Dubai Executive Council, the Dubai Islamic Economy Development Centre (DIEDC) is gearing up to host the fifth Islamic Economy Award on 27 November, 2017 under the patronage of His Highness Sheikh Mohammed bin Rashid Al Maktoum, Vice President and Prime Minister of the UAE and Ruler of Dubai. A joint initiative of DIEDC and the Dubai Chamber of Commerce and Industry (Dubai Chamber), the Award recognises the efforts of institutions and entrepreneurs across the world in offering innovative concepts that best integrate Islamic economy standards and have a positive impact on global socio-economic development. The ceremony will give away eight awards, as well as the Lifetime Achievement Award to one notable individual whose work over several decades has inspired others and had a major positive impact on the Islamic economy. 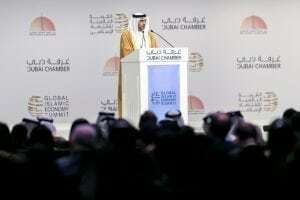 He added: “The UAE is looking forward to marking a historic centenary milestone in 2071 through successfully securing resources to grow and diversify the national income away from oil, increase productivity in national economy sectors, invest in youth capabilities, and reinforce values and ethics in the education ecosystem. These are the principles that make Islamic economy a key partner in building generations that will enjoy a happy life, a safe environment and a bigger opportunity to communicate with the world. Al Mansouri pointed out that the Award with its benchmarks has improved awareness about the importance of sustainable social impact of economic activities, and has created a new culture of competitiveness that is based on humanitarian and social dimensions, without only focusing on the quantitative accumulation of products and wealth. He mentioned that this culture has become today a target that the largest world economies are seeking to achieve in their investments. For his part, His Excellency Majid Saif Al Ghurair, Chairman, Dubai Chamber of Commerce and Industry and Board Member of the Dubai Islamic Economy Development Centre, said: “The Islamic Economy Award, which we organise annually in cooperation with DIEDC, is one of the world’s most prestigious awards to honour innovative and Islamic-compliant businesses and institutions that have a positive impact on economic and social development in the world. The Award has become an incentive for participants around the world to launch the best products and solutions that are compatible with the goals and objectives of Islamic economy. The Award also encourages the new generation to contribute to a better sustainable future. 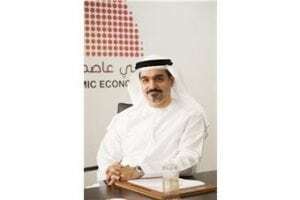 His Excellency Hussain Al Qemzi, DIEDC Board Member and Head of the Award’s judging panel, said: “Since its launch in 2013 under the patronage of His Highness Sheikh Mohammed bin Rashid Al Maktoum, the Islamic Economy Award has attracted more than 1,100 applications from 47 countries, demonstrating Dubai’s leading status in its efforts to emerge as the global capital of Islamic economy and a key centre for developing the legislative and regulatory environment of the Islamic economy. Al Awar said that the Award has always been a shining proof of the flexibility of the standards and ethics of Islamic economy not only in keeping pace with development but in inspiring many individuals and institutions around the world to innovate.